James Mao made a left-handed layup, the most important bucket of his career-high 31 points, at the buzzer as Pure Youth beat dmedia Numen 108-107 Saturday. PY snapped its three-game losing streak against dmedia and won its fifth straight game. PY is now 9-10 and tied with Dacin at No. 4. With 14.2 seconds left and the score tied at 106, Pure Youth head coach Hsu Chin-tse ordered his players to foul dmedia, sending Ouyang Jin-hen to the free-throw line. Hsu's decision proved successful as Ouyang made one of two free-throws and handed the final possession back to PY. Going one on one against Jonathan Sanders, who had his second triple-double of the season, Mao pulled the final daggar on dmedia with a high-arching left-handed layup. Dmedia shot itself in the foot by missing four of eight foul shots with the game on the line. Defending champ Taiwan Beer showed its poise down the stretch by overcoming a 15-point halftime deficit with a 92-90 win over Bank of Taiwan. Taiwan Beer, which trailed for 35 minutes, led by one, 91-90, after Ho Sho-jen's two free-throws with 8.3 seconds to go. 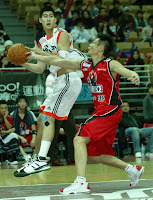 BOT controlled the last possession but point guard Chien Ming-fu stepped out of bound as he was pushing the ball upcourt. * PY surpassed its win total last year with 8 wins in 18 games. 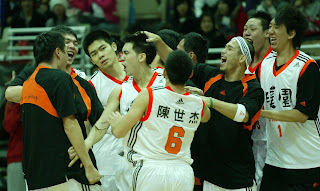 The 40-point margin was the second highest winning margin in the SBL history.